We are all dying… from the time we are born we are marking time upon this earth. From the age of 25 our cells are dying faster than they are repairing. Ageing is part of the dying process which escalates the older we get, some of us sooner, some of us later, depending on genetics, immunity, physical experiences along the way. We have scares now and then… a brain injury we endure from an abuser but live to overcome, our own reckless substance abuse or suicidal endangerment, an infection that lasts 7 months and almost kills us, the loss of respiratory drive that leaves a machine doing our breathing for us, breast cancer we give up our breasts for, endure chemo for, take Tomoxifen for for 4 years and 10 months… And sometimes those scares cross the line. They are no longer scares, for we learn our cancer has returned, we have widespread metastatic spread to the liver, the cancer is also in our spine, we are neutropenic and death looks most potentially just around the corner. So many things happened this year… I found myself turning a corner. I had always been a creation factory, producing art, music, writing, and within a few months I just found I had moved from ‘doing’ to a great contentment with simply ‘being’. I was not depressed, life just seemed to look different. Almost like a ‘Spring’ had arrived though we were in autumn entering winter. It was a spiritual shift. I didn’t know what it meant but it felt more than ok.
My father had saved my life and my sanity from a new born to a four year old, from a brain injured 12 year old, to giving me the keys to my own past when I wrote Nobody Nowhere in 1991. But he was also a serial womaniser, a wife basher, and a criminal, and no amount of mitigating circumstances could change that he was both hero and monster. He had been married before he was with my mother. This first wife would be the only one who could tell me if my father was monster before he was with my mother or if his marriage to her had brought the monster out in him. It took us years to find his first wife, but this year we found her. She was wonderful, warm, sweet and instantly a comrade. She told us that, yes, he had always been a serial womaniser, was not present in their marriage, and it had ended with a teenager who arrived with a baby she had left with her in the early hours of the morning. When she confronted my father upon his return about the baby, she was bashed and ran away, starting a new life with a new identity. And so it was resolved. That the teenager may well have been my mother, and that my father was in fact always this monster. But as she got to know me and Chris, and deeply relate to and honour me, she saw that good had come of the monster that was my father. And I knew that as a Taoist it was ok to love without conflict, to accept without judgement, to be at peace with what had been his journey. It was a year of reconnecting with the dead ancestors, walking in their shoes. In June, I had nocturnal seizures for the first time, by July I had lost the use of my legs for 2 minutes. By August my sleep attacks had returned and so I decided it was time to stop driving. I resolved to address it with positivity, buy an electric bike and get more involved with my local community. It was as though my world was shrinking, becoming cosier, telling me I needed to bring everything closer to home, within walking distance. Then in August it was the ten year anniversary of the diversity friendly dinner club Chris and I had established in 2006. Members past and present descended on the restaurant, ate, chatted, had cake, enjoyed the merriment, inclusion, this autism friendly haven that was now a community event and a place of home. I couldn’t eat, I’d been sick for a few weeks. By late August, the Osteopath had seen me for a severely locked up diaphragm on my right side. It made it hard to breathe. I rode there on an electric bike, very proud of myself. It was the worst case of a locked up diaphragm she’d ever seen and she was surprised I’d ridden my bike there. I asked if she’d email the GP about it. She said she would. Within a week I was unable to eat solid food, was struggling to breathe and went to my GP. It was gastritis, very mundane, and I was given proton pump inhibitors which immediately made me sick. But I determined to give it two weeks on a low acid diet to see if I couldn’t solve this sudden first time in my life attack of gastritis. Two weeks later I had still not eaten solid food. Weight was dropping off me and I had to choose between fluids or food for I could not intake both. I had lost 3 kgs. I explained the problem was on the right, not the left, and so the GP ordered an ultrasound for gallstones. “Could we please do a blood test, just in case?”, I asked. He ordered one and we waited casually for a week for the results. He got the results on the Wednesday the following week. It was alarming. Ferritin was 1000 times the high level, liver enzymes and cancer markers, all raised. He phoned. He wanted me and Chris there first thing in the morning to repeat the blood test, then straight for an ultrasound of the liver. The queries on the referal slip quickly changes from questioning gallstones and haemachromatosis to just reading ‘extensive metastatic spread of breast cancer to the liver’. Then was a CT scan and the verdict: innummerable tumors in the liver, largest of them 3cm, and a 0.5cm tumor in the spine at L5. The GP, deeply shaken and saddened at our situation, had spoken to the oncologist, I had an appointment tomorrow, Friday. 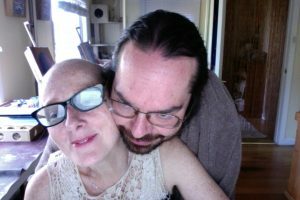 Chris, my husband, best pal, and the love of my life for 17 years, and I sat opposite the oncologist. He explained my situation was not good, that it was not a curable situation. I had already read that extensive metastatic spread to the liver could mean a prognosis of 4-6 months but if really favorable as long as 20 months. We expected he would offer only palliative care. He said he felt he could shrink the massively enlarged liver and gain me some time but that there was nothing effective in my situation except chemo. Chris and I jumped at the chance, asking when. First thing Monday, he replied. I would come in, get a picc line inserted into my arm and a line run into a vein near my heart and all my bloodwork and chemo would be delivered through it. Then I’d go straight to the chemo ward. We went home for the weekend, to cry, love, laugh, plan. In spite of the corner our lives had just turned we still felt blessed.